With a vision of moving from their existing small, cramped offices and warehouse on the North Side of Pittsburgh, Tri State Flooring sought a new beginning that would allow for future growth and evolution. Having originally considered a pre-engineered building in an established industrial park for their new facility, Tri State determined that their company needed a fully integrated new building inst and engaged qkArchitecture to re-examine and implement their vision. The proposed design offered a centrally located office core with two offices for each partner flanking the entrance of the new building. In addition, the layout included one additional office for future expansion as well as a plan review and bidding area. Access and control of the warehouse is maintained by direct connection through office core and visual control of the loading dock area with an exterior window. Additionally, to address the all masonry building requirements stipulated in the covenants of the industrial park, and working within the budgetary constraints, the facade of the new office was designed with a jumbo brick and a metal panel wall system used to distinguish the office from the warehouse. 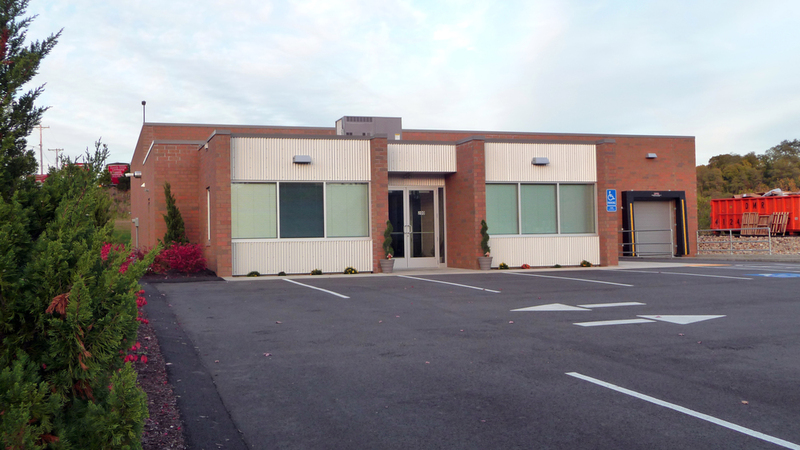 The new Tri State Flooring Office and Warehouse is Castle Shannon, PA was completed in early Spring of 2013.